The cliffs and landscape of Head Smashed in Buffalo Jump near Fort MacLeod in Alberta, Canada. While vacationing in Alberta, Canada be sure to explore this fascinating tourist attraction known as Head Smashed in Buffalo Jump in Alberta, Canada. This is one of the largest and oldest buffalo jumps known throughout the world and has become a heritage site since 1981 due to the prehistoric life of the natives. 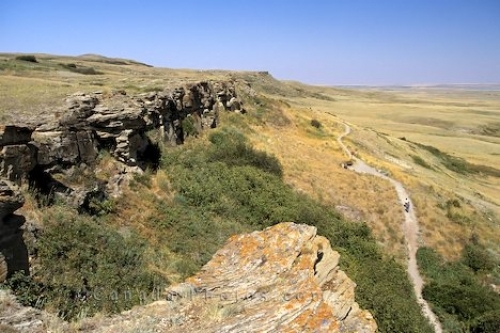 Picture of the UNESCO World Heritage Site known as Head Smashed in Buffalo Jump in Fort MacLeod in Alberta, Canada.